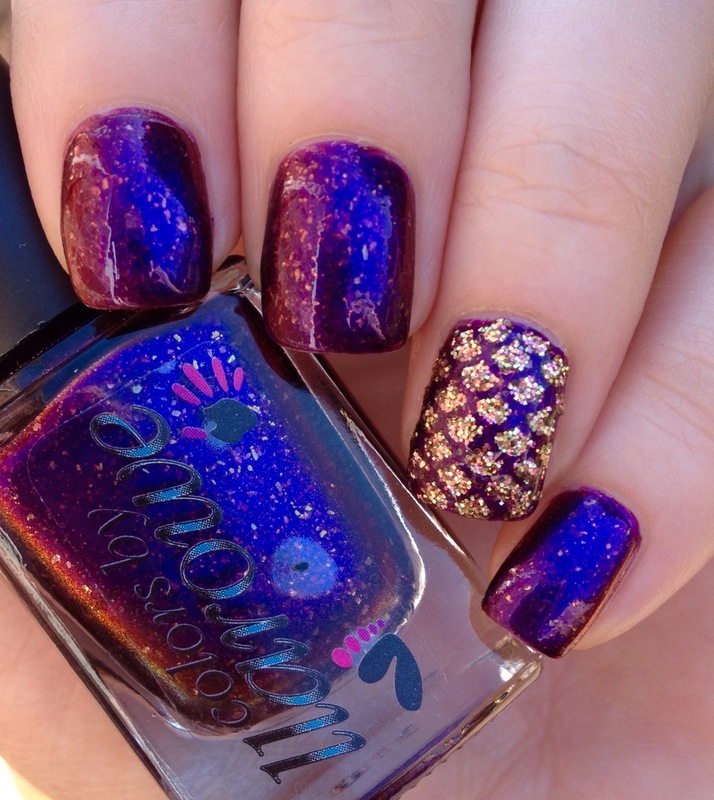 I thought we might take a quick break from the regularly scheduled [holo] programming to check out a cool duochrome. 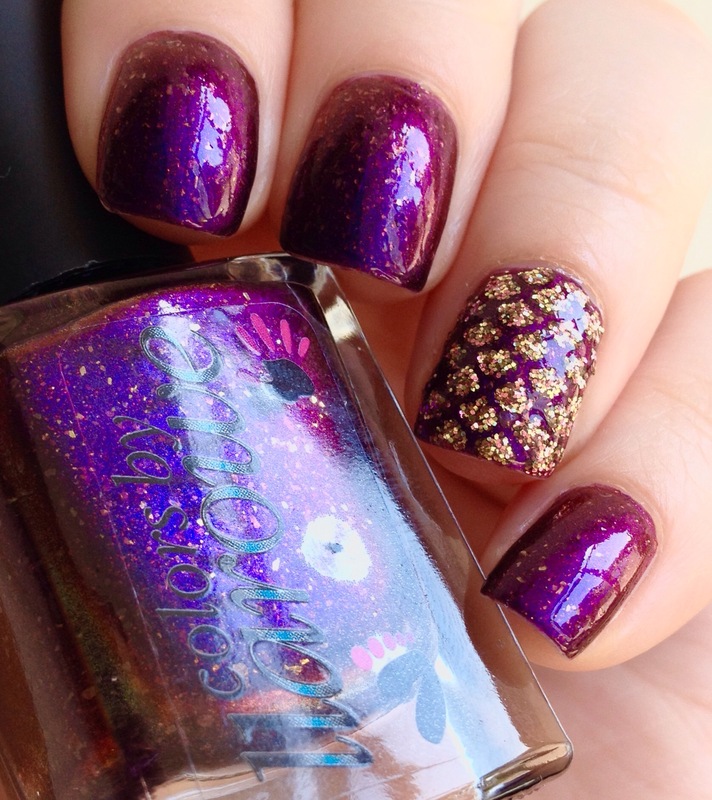 This time around, I’ve got Colors by Llarowe “Hellcat,” an orange to purple duochrome with copper-colored flakies. Hellcat is on the thicker side, viscosity-wise, like many CbL polishes. Personally, I’m a fan of the higher viscosity, because I feel like there’s a bit higher margin for error. It is thick enough that I’m not slopping it all over my cuticles (which, you know, is a real possibility). This is two coats- also impressive for a duochrome, since that finish tends to run on the sheerer side. While I was admiring the duochrome in the low lighting of my apartment in the wee hours of the night (seriously- low light and shower lighting are the best for bringing out the full range of duo- and multichromes! ), I decided to add an accent nail. Playing off of the colors in Hellcat, I went with a mermaid theme. For the accent, I used Ellagee “Black Hills Gold,” a glitter I find myself reaching for all the time. Additionally, to created the look of the mermaid scales, I used vinyls by Crystalluxe that just came in the mail (hence the temptation). 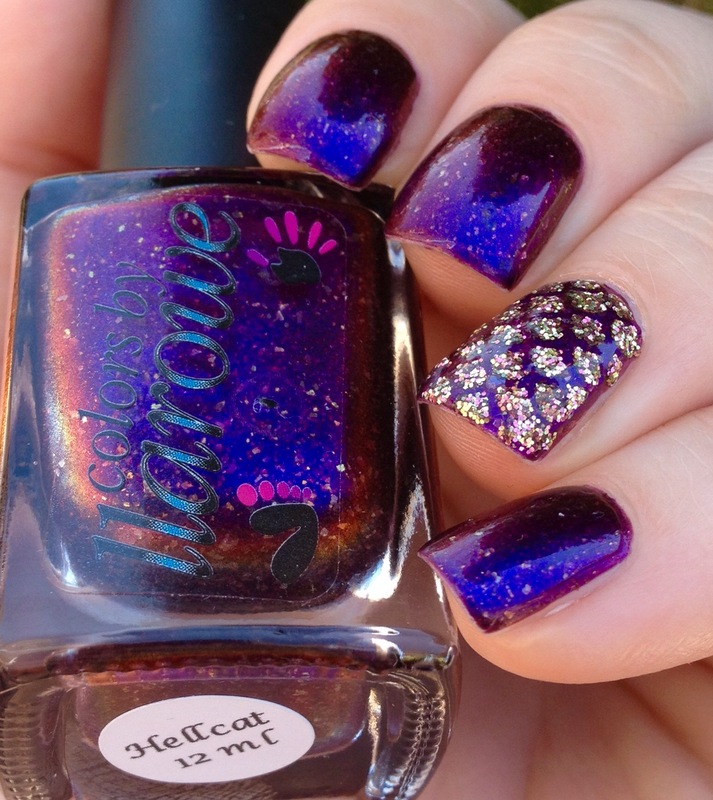 I believe that Hellcat is discontinued, but CbL polishes of many varieties are available on Llarowe’s website. The last year or so has also seen a craze for duo- and multichrome polishes, so you should be able to find something similar that tickles your fancy. 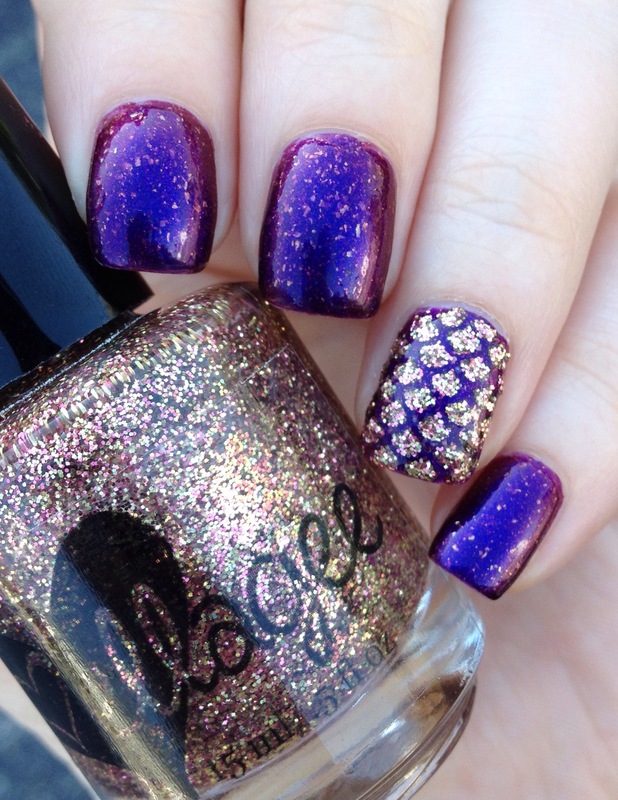 Ellegee polishes can be found on her website. I recently bought the mermaid vinyls on Crystalluxe’s Etsy page and was really impressed with the turnaround and shipping times. Also her shop has a great variety of really highly detailed vinyl patterns that I haven’t seen anywhere else.